Because my ministry messages are story-based, when I read Chuck Neighbor’s recent blog about story changing his life, I got to thinking about how story has impacted my life. I realized that sharing our stories is a way to reach out to each others and form emotional connections that result in understanding, compassion and unity. Sharing our stories cross barriers and teach truths in ways that simple conversations cannot. Hearing the stories of others reassures us that we are not alone. Stories comfort and confront; stories inspire and challenge. I’m very grateful to Chuck for allowing me to share his blog on my website. I’m hoping Chuck’s message inspires you to be brave in sharing your stories, because you never know whose life you might change. 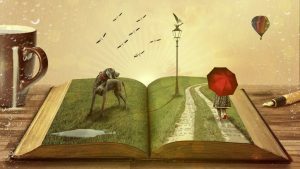 Can a Story Really “Change” Your Life? “It changed my life” is an adage that’s often repeated. There are certainly events that are life-changers: birth, graduation, job, marriage, children, death… and so many more. But can just the simple hearing or reading of a story actually change your life? I’m not talking about making us laugh or cry, or evoking emotions of compassion or anger. Those are a given. I’m talking about tangible change that results in action. Change that makes someone do or live differently. As a storyteller I have heard “life-changing” applied to my craft. I have often accepted the statement as a compliment, but not taken it too much to heart. I am not sure I really believed that someone was going to live their life differently because they heard a story I told them. I decided to put it to the test. Could I actually point to life-change in my own life because of stories that I heard or read? Once I seriously considered the question I was surprised at how quickly the answers followed. It was through hearing and reading the Gospel story in my youth that I became aware of a need for Christ in my life. It was the added stories (testimonies) of other believers that convinced me to become a follower of Jesus, a change that resulted in me living my life differently. It was hearing the stories from a missionary to South America at a youth retreat in Michigan that I became convinced that I wanted to actually serve God as a vocation. One of the few Spanish phrases I can actually remember is the translation to a familiar song that he taught us: “He decidido seguir a Cristo” (I have decided to follow Jesus). I didn’t know the path I would take, but I have never considered a job for more than a brief season of my life that was not also a ministry. It was through first seeing plays as a kid and then performing them that I discovered my passion was to be on that stage as a performer. I wanted to tell stories like the ones I was seeing–I wanted to live them. It became the inspiration and motivation for me to find a way to combine my desire to serve God with my desire to be a performing artist. My first job after college was 10 years on the road with a professional touring theater ministry. It was reading the book In His Steps by Charles Sheldon that challenged me with the famous question “What would Jesus do?” Little did I realize that years later that same story would keep me awake at night–a still small voice saying “tell that story.” Later adapting that book to the stage has indeed been life changing. It launched my current ministry and set the course of my professional/ministry career from 1984 to this day. My answer is without a doubt, yes!